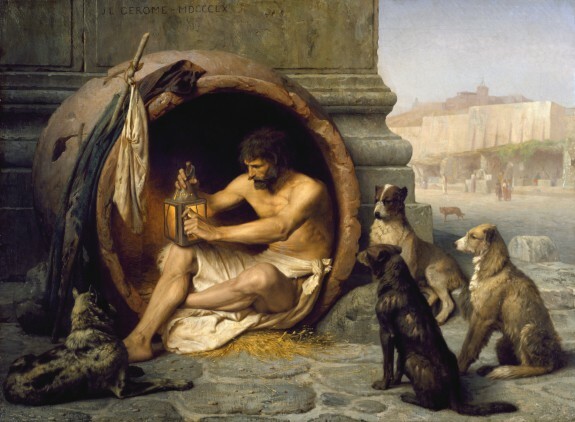 Description The Greek philosopher Diogenes (404-323 BC) is seated in his abode, the earthenware tub, in the Metroon, Athens, lighting the lamp in daylight with which he was to search for an honest man. 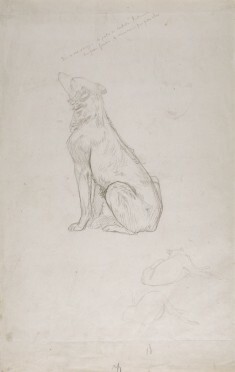 His companions were dogs that also served as emblems of his "Cynic" (Greek: "kynikos," dog-like) philosophy, which emphasized an austere existence. Three years after this painting was first exhibited, Gerome was appointed a professor of painting at the Ecole des Beaux-Arts where he would instruct many students, both French and foreign. Hommage à Baudelaire. Art Gallery, University of Maryland, College Park. 1968. Jean-Léon Gérôme. Dayton Art Institute, Dayton; Minneapolis Institute of Art, Minneapolis; The Walters Art Gallery, Baltimore. 1972-1973. Gérôme and Goupil: Art and Enterprise. Musée Goupil, Bordeaux; Dahesh Museum of Art, New York; The Frick Art & Historical Center, Pittsburgh. 2001. Provenance Purchased by Goupil et Cie, Paris, March 7 1865 (from whom purchased is unclear); purchased by Ernest Gambart, London, March 3 1861; purchased by August Belmont, New York, before 1864 ; August Belmont Sale, New York, November, 1872, no. 31; purchased by William T. Walters, Baltimore, 1872; by inheritance, Henry Walters, Baltimore, 1894; by bequest, Walters Art Museum, 1931. The Belmont Gallery : on exhibition for the benefit of the U.S. Sanitary Commission, Monday, April 4, to Saturday, April 9th : open every day from 9 A.M. to 6 P.M., 109 Fifth Avenue, cor. 18th Street, entrance 4 East 18th St., No. 51.